Fall represents a season of change, as the growth and life associated with the summer months come to an end, dying off to rest for a season before generating new life in the spring. 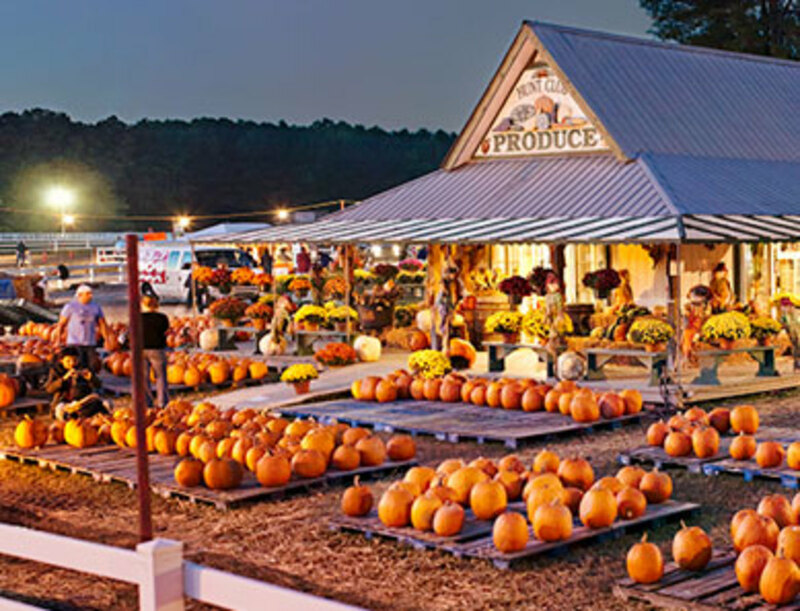 Those autumn changes include the beautiful coloring of the leaves, pumpkins and gourds, Halloween, hay, scarecrows, and a plethora of other things that have come to represent this amazing time of the year. And because fall is in reality harvest time, this includes the same in many parts of nature itself, which allows you to be able to hunt around and find pine cones, fallen corn and a variety of nuts you can use to make your yard look seasonal. If you don't have a yard with some of that, or someone living in the country you know, you can always acquire some of these from your local stores, as there are plenty of these types of goodies made ready for use. You can also buy winter squash, as it's ready to harvest during this time of the year, and have thick skins which will allow them to last for awhile. If you grow winter squash, all the better, you can just take it from the vine and place them where you want. Fall and Halloween have become so synonymous with one another that it's difficult to separate them because of the use of similar items to create the look. 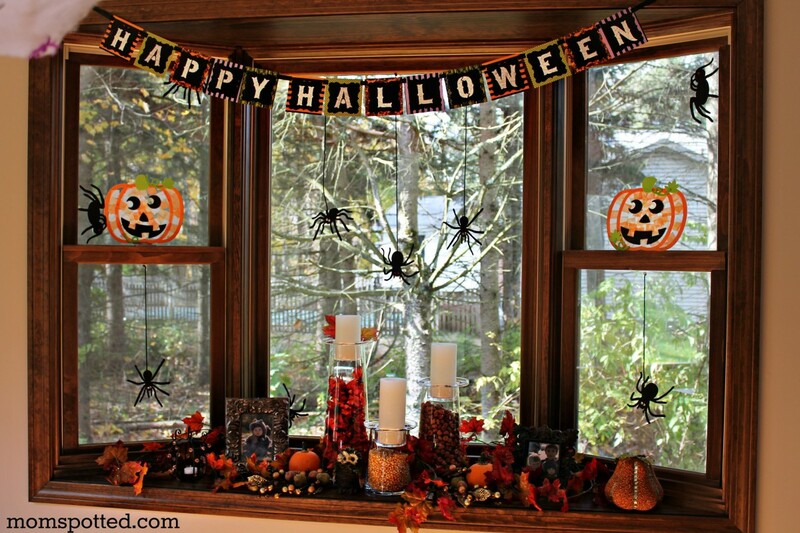 This isn't hard to overcome for a fall look without the Halloween theme if that's what you want in the early part of the season, as you can simply set up your outdoor fall decorations as you want them in the beginning, and when it gets closer to Halloween add the props and items associated with that particular holiday season. Some objects like scarecrows work for both themes, but others like orange lights and scary characters are specifically related to Halloween, so they can be added later without taking away from the early fall decorative look you choose to display. Whether for fall itself or Halloween later, the foundation for both yard decorations are the same, as are the items used to generate the look. We already talked about things like pumpkins, corn winter squash, gourds, corn, nuts and pine cones. Before we get into more, when thinking of nuts, the most obvious is acorns, as they are widely available in most parts of the country. But that can change from region to region, and whatever is available should work fine and look great. After all, people relate to whatever is growing where they live, so nuts available in one part of the country will work great in that locality. So you don't have to try to reinvent the wheel to get a good result, just use what is available to you in those cases. 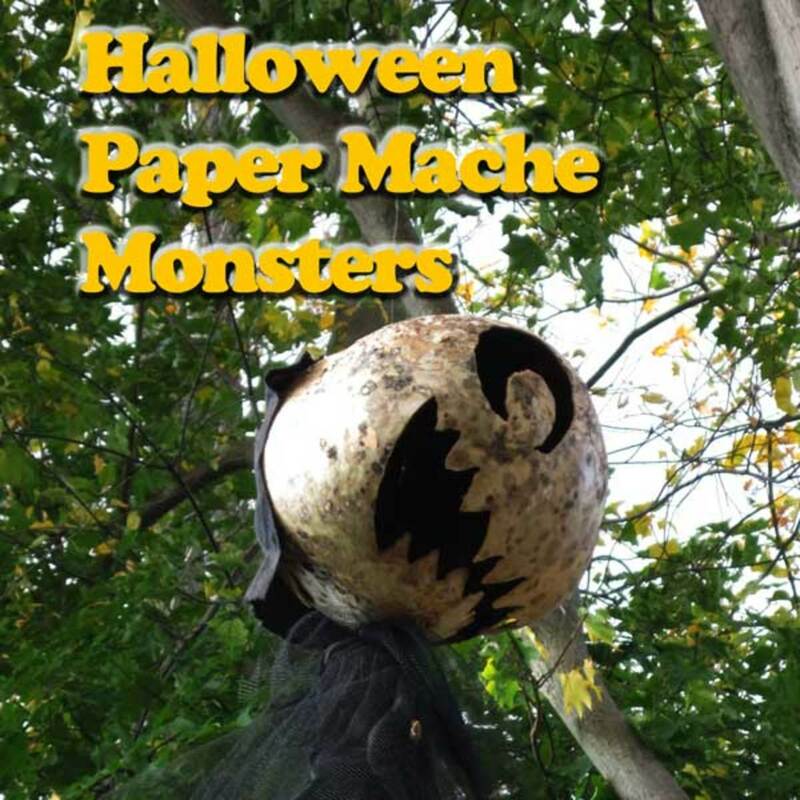 Another great fall prop is a bale of straw, where you can use it for a base or stand for all sorts of fall or Halloween designs. The bales of straw can also be stacked like stair steps to create an even larger display if you have something bigger in mind. When decorating your yard for fall, the more things you use from nature, the better it is; although additional props displaying these natural materials provide a fantastic look as well. If you have children or grandchildren, there are many things you could temporarily use associated with them you could use to display the natural things we mentioned above. For example, you many have wagons for them to pull around which make excellent based to display pumpkins, gourds, and all the other items. Of course you may have to do some negotiating to help them understand why you want and need to use the toys you have usually set aside for them. Other familiar items that can be used are a birdbath in the yard that is finished being used for the season, outdoor chairs, or tables. The tables would need to be built with materials that are able to withstand the weather. We use glass tables with frames that withstand the impact of the weather. Wheelbarrows are also terrific for placing unique fall displays in to spruce up the place. You get the idea. 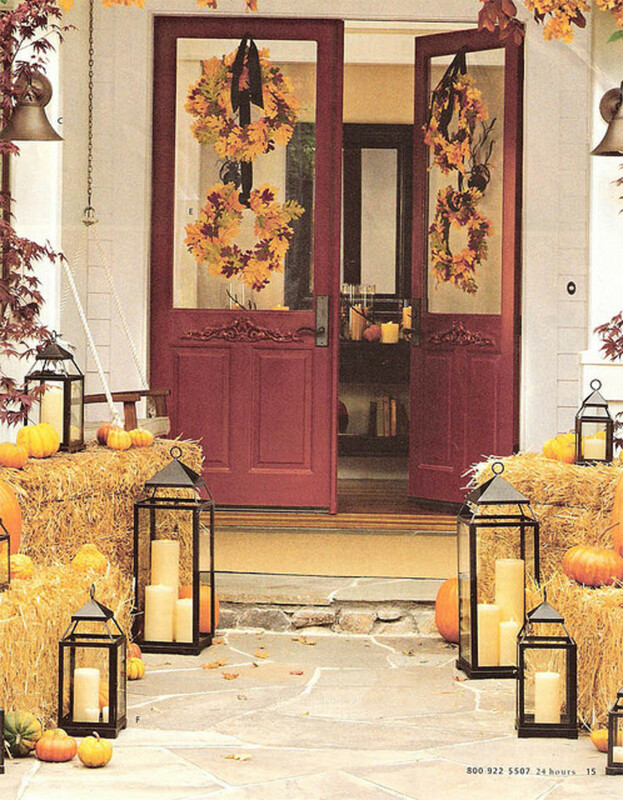 Anything that can be used in a way that flows with the fall theme works in any outdoor yard decoration situation. Other things you may consider are outside window sills, barrels, benches, old farm equipment like hand plows, and many other everyday tools from the past. 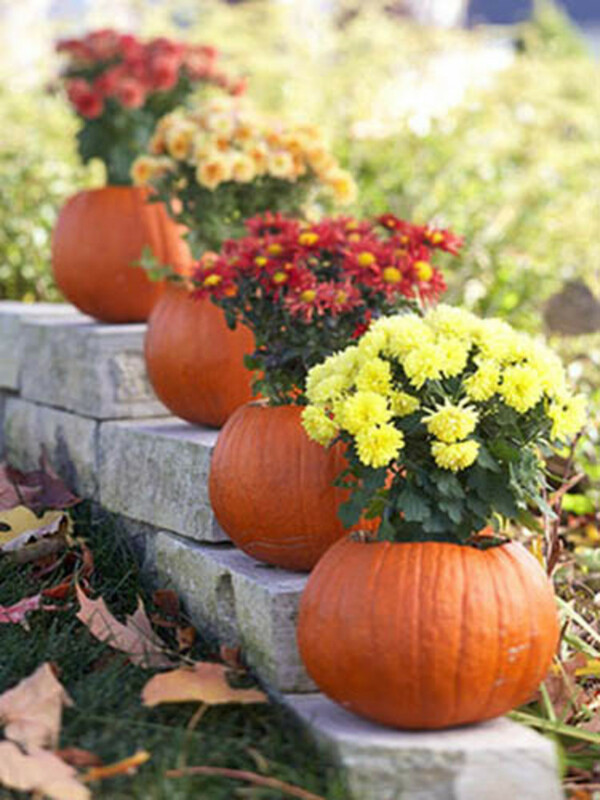 While the fall season is harvest time for many flowers and crops, it's not for all, so when many things are dying off, flowers that thrive in the autumn, such as the most obvious - mums, are ready to take over and offer beautiful color to your yard, which can be mixed in with the other decorative landscaping. 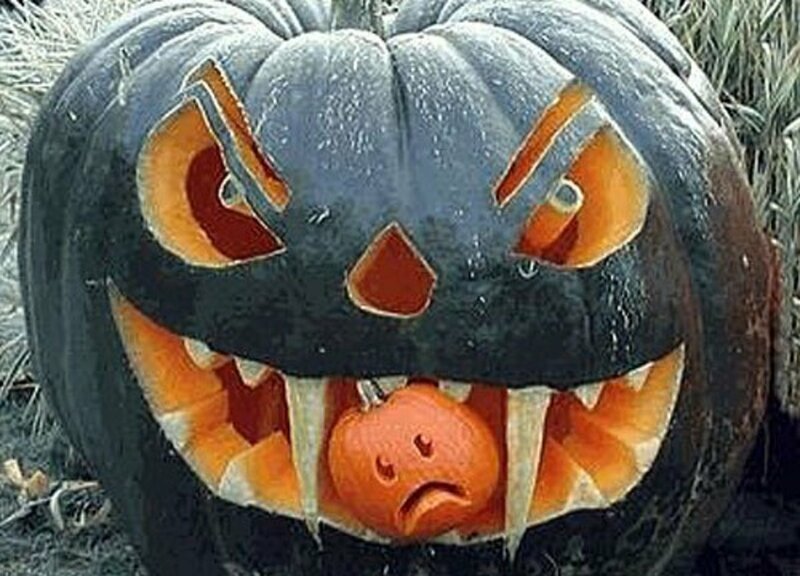 Now once you have everything in place and Halloween is approaching, you can then add all those outdoor characters or props associated with the season. 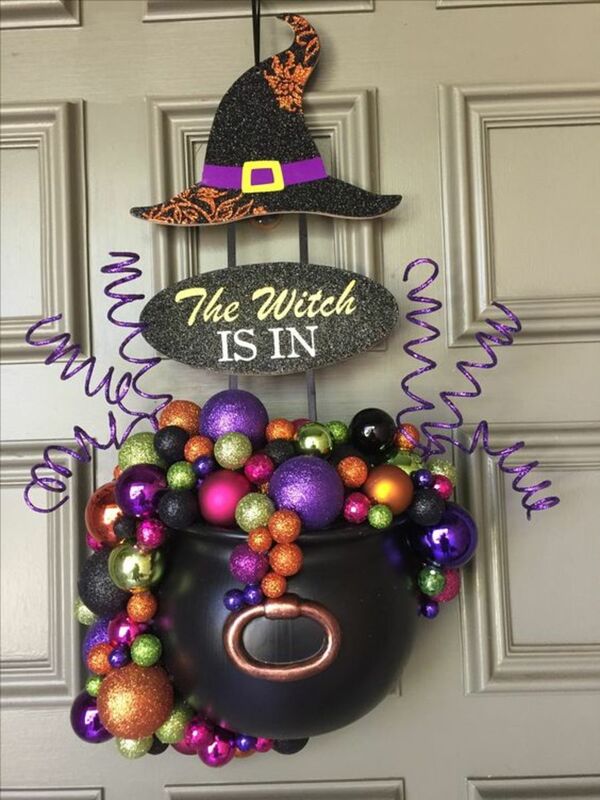 Some easy things that you will have around your home are old brooms, pitchforks, easily made scarecrows, and whatever Halloween yard theme you decide upon. 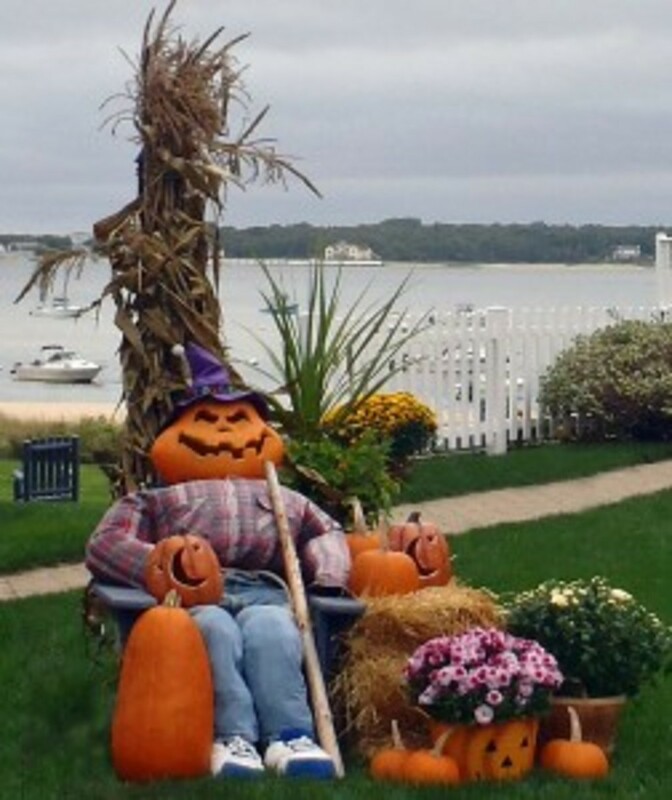 Now let's look at some of the fall and Halloween yard decorations others have decided to landscape their yards with. 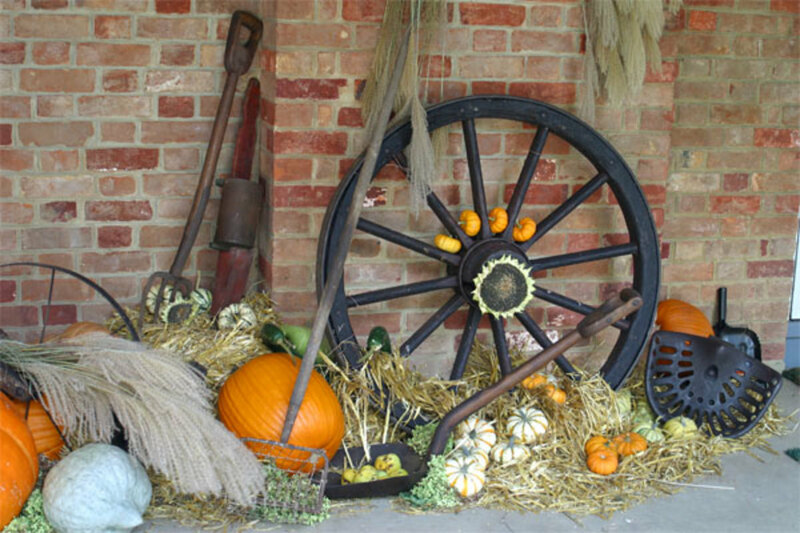 In this first photo was have a great example of the many materials and objects you can incorporate into your yard for the autumn and Halloween season. 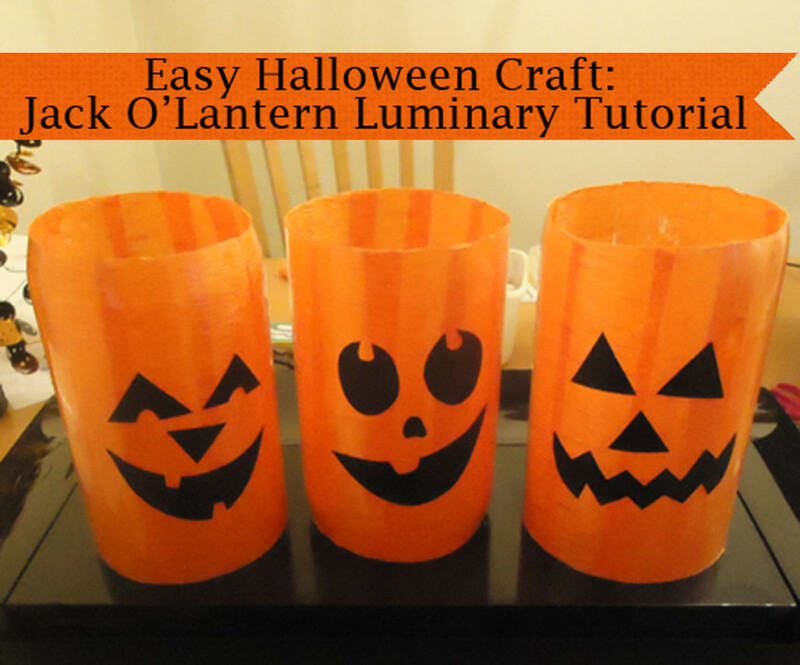 Other than the pumpkins, gourds and winter squash, this is an entirely different set of materials you can use to create awesome displays. Particularly cool was the way the wheel was decorated with the miniature pumpkins, as was the simple use of the shovel as a place to display apples. Other interesting ideas included the long-handled fork, the black tractor seat to the right, and the long ornamental grass on the left. All are great ideas. Here we have the stuffed scarecrow sitting in the chair with the piece of wood at his side to apparently beat off the crows. Also looking good are the mums to the right surrounded by pumpkins and a bale of straw. I like that tall pole in the back of the scarecrow as well, made from corn stalks and long grass that were turning for the year. Finally, the two pumpkins carved with a moon and the stars, fit in like bookends on the knee of the scarecrow, as well as on the table, were a nice touch, finishing off the great scene. For those who want to stretch their fall look deeper into the year, here is a great example of a way you could transition from Halloween to Thanksgiving. It also gives some wonderful ideas for fall as well. 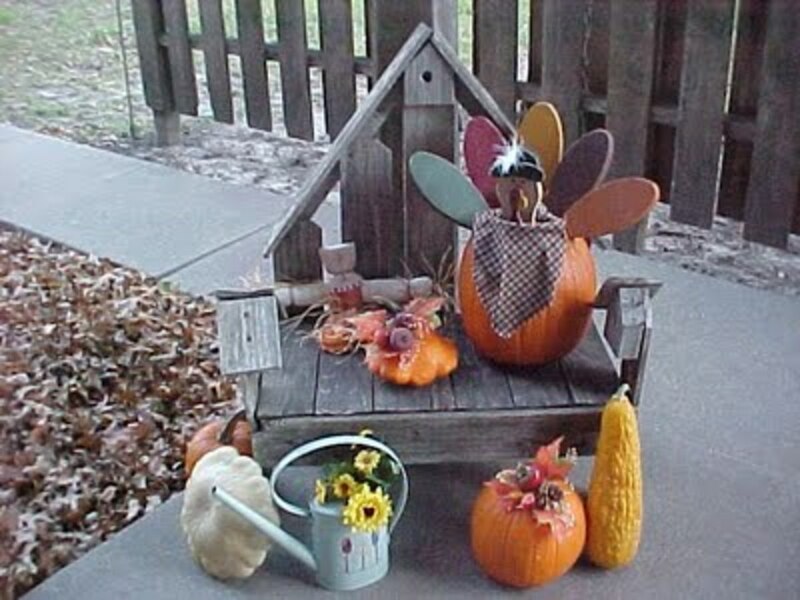 A couple of new things here are the watering can with flowers on top and the interesting use of the wing-shaped, colored wood to create the look of a male turkey with his wings extended. Very cute. It is also neat to see the old wood platform used in this manner. Most of us could put together, or have put together for us something similar. We may even have something like this laying around in a basement, storage, barn or shed. This fall display was included because of the simple but effective way the bricks were used to create a stair step look, which offers an easy but dramatic way to show almost anything you want to. These types of bricks, or other types that are similar in look, but have the two open square-shaped holes in them, are pretty inexpensive, and as you see, can very easily be put together like this, or in another shape, to provide a base to creatively work from. Below are several videos offering a variety of ways to make a great fall scene in your yard, with some demonstrating how to do it, and others showing the finished product in a way that is easy to emulate. 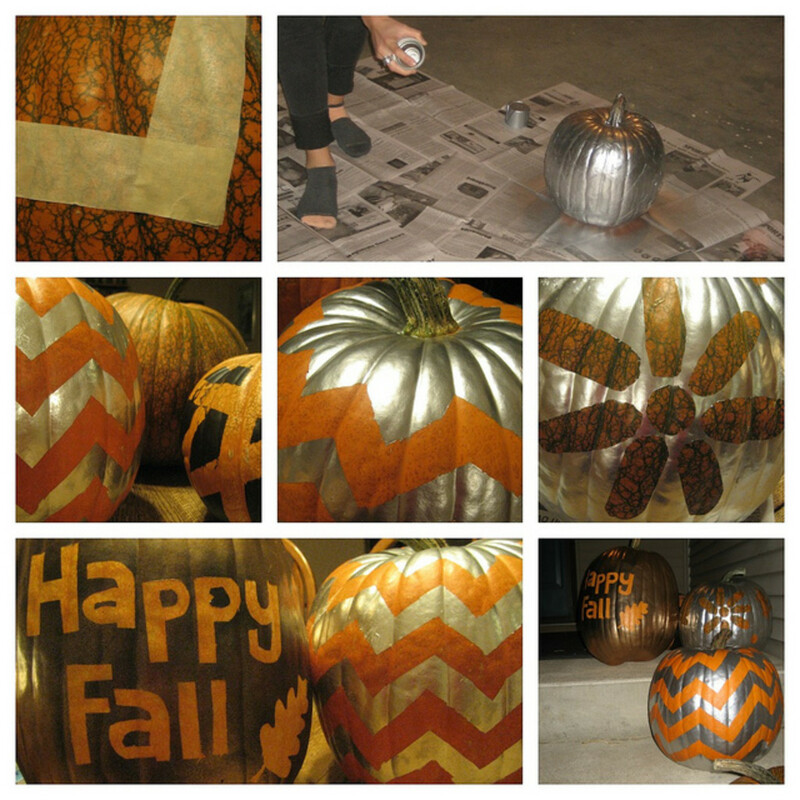 Sometimes we can get our creative juices flowing in such a way that we can forget some of the simple but beautiful ways to decorate in the fall. 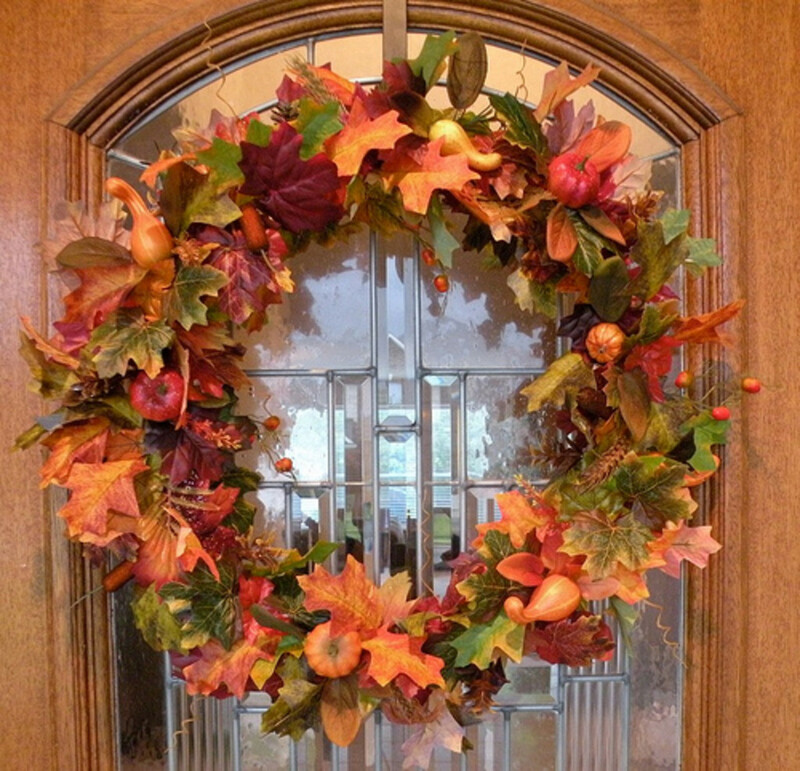 For that reason I wanted to include this autumn wreath as a reminder of how fantastic these wonderful objects can be, and how welcoming they make a visitor feel when entering your home. 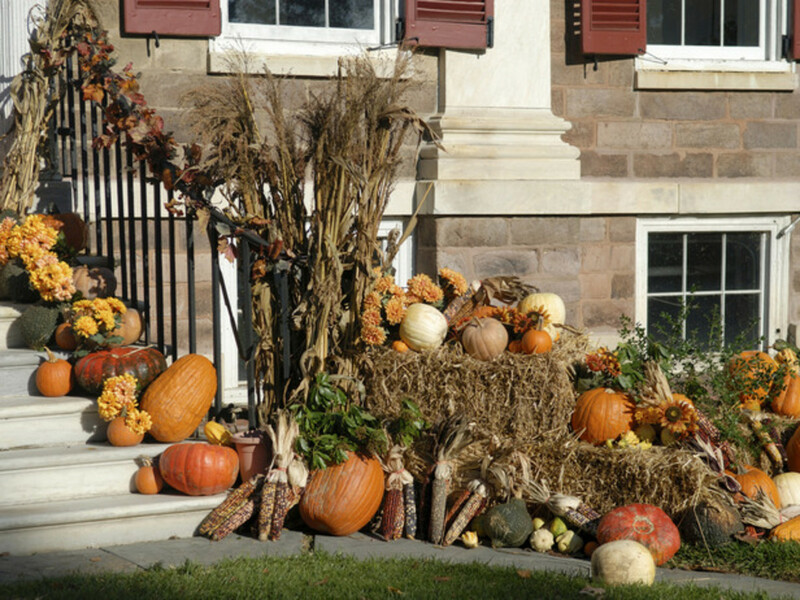 Talk about an ambitious fall decorative project for the entryway. 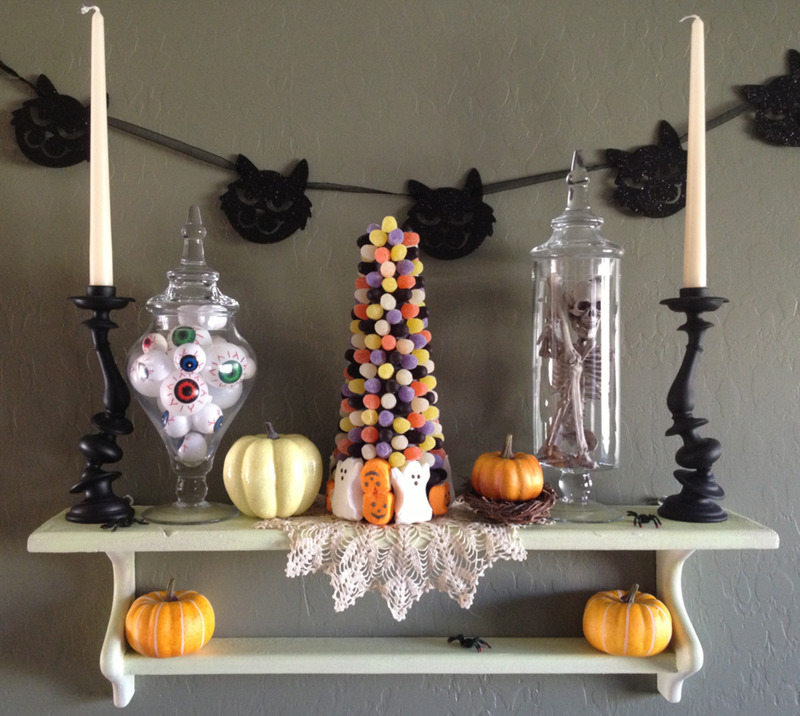 While I know most readers aren't going to go this far, there are a surprising number of people that like to go all out for their fall look, and this is for them, although it is great to generate some ideas to incorporate into a smaller display. While we don't see the entire picture, it implies not only a magnificent entryway display, but one that appears to spread across the front of the house as well. The use of the steps is a natural way to place your items in a way that everyone can see, as is the way the straw was placed so corn and other materials could be laid against them at the base, but also to use as platforms to place other objects. Also nice looking is the tall grass tied at the base of the steps as a backdrop to the rest. Great fall look. Now for those of you who are very ambitious, here is the biggest group of fall yard decorations I have ever seen. It would probably cost a little bit of money, but it would be worth it in the end ... wouldn't it? Okay, before you're ready to quit, I am only joking with this one. If you didn't look closely, this is a place of business that sells pumpkins, mums, and other items for the fall season. Hopefully you weren't scared off when you took your first look at it. You can see from these photos and videos why the fall is such an inspiring time of the year to decorate our yards. There is an almost infinite number of ways to do the job, and a large number of items we can use to create the desired look we want. Whether you want to build something memorable for all onlookers to enjoy, or a small display to accentuate the yard, or a place in the yard, you now have a lot of ideas and inspiration to work from. Useful tips to brighten your yard.